Although a vegetarian diet may be best for reducing your blood pressure, this doesn't mean you need to cut all meat, fish and poultry out of your diet. Red meat, in particular, is associated with increased blood pressure, but you can still eat at least small amounts of lean, unprocessed red meat. Seafood and skinless poultry, however, are healthier choices for people with high blood pressure. The electrolyte mineral potassium can help counteract the adverse effect of sodium on blood pressure. Many types of fish and seafood are good sources of potassium, making them nutritious choices for meeting your recommended protein intake. 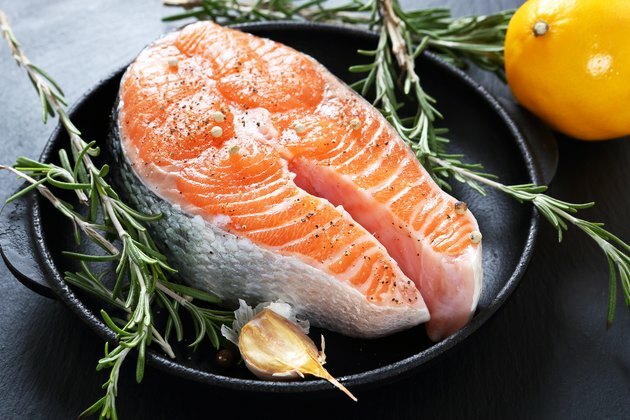 For example, a 3-ounce serving of salmon or pompano provides 15 percent of the daily value for potassium, and mackerel, lingcod, halibut and yellowfin tuna provide at least 10 percent of the daily value per serving. Clams and whelk are other potassium-rich seafood choices. The Dietary Approaches to Stop Hypertension, or DASH diet, recommends poultry as well as fish for meeting your protein needs, allowing up to six servings per day of fish, poultry or lean red meat. Chicken is also relatively high in potassium, with about 383 milligrams, or 9 percent of the DV, per 3-ounce serving. Choose skinless poultry, which tends to be lower in fat than many cuts of red meat. People with high blood pressure should limit the amount of saturated fat they get in their diet. This typically involves eating little red meat and choosing from the leanest cuts when you do eat it. Beef and lamb do have a moderate amount of potassium, with 290 milligrams and 259 milligrams per serving, respectively. The leanest cuts of meat include those that contain the words "round" or "loin" in their name, as well as flank steak and 95 percent lean ground beef. Limit the amount of sodium in your diet to help keep your blood pressure under control. This means using herbs, spices and fruit juices to flavor your meat, poultry and fish rather than salt or ready-made sauces, which often contain high amounts of sodium. Cut off any visible fat from red meat and poultry before cooking, and use healthy cooking methods such as poaching, broiling, grilling, roasting and steaming instead of frying.